OMG, Barrett has finally started the wainscoting! I was beginning to wonder if this day would ever come. 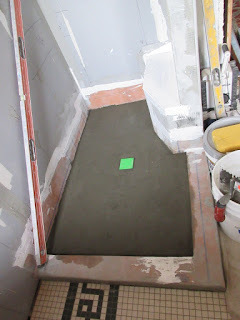 The shower floor is also ready for tile. Barrett said he had to order more of the white mosaic floor tile, so that project is now waiting for the order to arrive. So, I changed our wainscoting plan again. Sigh. When we measured the bathroom the other day I realized I have exactly the right amount of the tile border as we need. 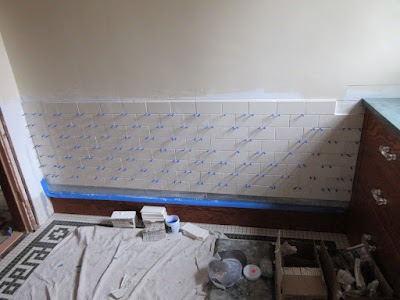 Now, normally, I would be happy to have just the right amount, but if there is one wrong cut.... And worse, we wouldn't have any extra to play with the arrangement so the pretty tiles don't hit in stupid spots. So we went back to my original plan. 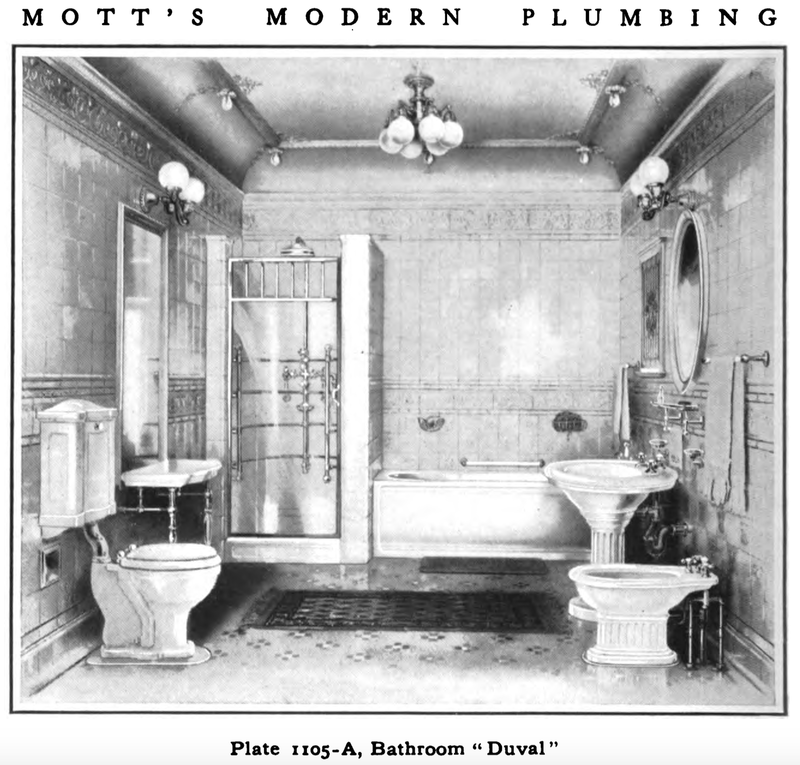 There were a number of bathroom tile pictures in the Trenton catalog that show two levels of decorative borders, so this design seems reasonable. It turns out DalTile doesn't carry the shiny ceramic tiles in anything smaller than 4x4, so I am currently on a quest to find attractive, but not too expensive, 2x2 accent tiles. I found some options, but getting the tile makers to respond to my inquiries has been a challenge. These are the top two options we are currently considering. Ugh, I am also trying to get our 2015 taxes finished, printed out and signed tonight so we can mail them tomorrow. Yuck. I had to file an extension. There was absolutely no way I could get all my info together in time. I might exactly get to work on the house tomorrow if the Sec. of State's office (DMV), my attorney's (DIL) is on time and goes smoothly, and the lunch time crowd is thin at 501. Somehow I think there will be a snafu some where and my $$ is on the DMV. My last encounter with them took 2 hours. Until then, as usual, I will live vicariously through your projects which seem to be moving at quite the pace lately. I am jealous because mine are moving so slow you can barely notice the change. We had at least 2 years where we did nothing, so don't feel bad. We are still far behind of my original plan. We are definitely trying to take advantage of our nice weather because once it gets too hot, the outdoor work will probably stop again.